Is Spike Lee's seminal film still relevant in the Obama era? Everett Collection Spike Lee in Do the Right Thing, 1989. Spike Lee’s seminal film Do the Right Thing takes place over the course of twenty-four hours during the hottest day of the summer in Brooklyn’s historic Bedford-Stuyvesant neighborhood. The story depicts simmering ethnic tensions between a group of African-Americans and the middle-aged, Italian-American patriarch of the local pizza place, “Sal’s Famous Pizzeria.” As the sweltering summer day draws to a close, an argument erupts between local youths of color led by “Radio” Raheem (his nickname comes from the massive boombox he is never seen without) and Sal. Pushed to the brink by Raheem’s radio blasts, Sal erupts into a vitriolic rant replete with racial invective, which culminates with his smashing of Raheem’s stereo. A fight breaks out and several other members of the community are drawn into the melee. Amidst ensuing mayhem, Raheem is killed by the NYPD, who strangle him with a nightstick in a scene that is eerily reminiscent of a lynching. The police officers eventually flee the scene with Raheem’s remains in tow, leaving members of the community behind to grieve and denounce the injustice of this killing and the many others that preceded it. In an act of defiance, Mookie (played by Lee himself), the pizzeria’s lone black employee, hurls a trash can through the pizzeria window, leading to the fiery destruction of Sal’s prized establishment. Black and white audiences tend to read race in radically different ways, as evidenced by the bifurcated responses to real-life incidents ranging from the Rodney King verdict down to the recent dustup over the arrest of Henry Louis Gates Jr. But even this observation conceals a fundamental asymmetry. The dominant culture’s typical response is to deny the centrality of race, a position that continues to dismiss African-American reactions as hypersensitive, race-obsessed, pathological, arrogant or rancorous. The privilege of ignoring racism goes even further than a vigorous denial of its salience; through a strange inversion, and as the example of Rush Limbaugh’s recent attacks on Supreme Court nominee Sonia Sotomayor make clear, people of color who raise the issue–or, in Sotomayor’s case, even downplay it–are labeled racist. As the film reminds us, refusal to accept the legitimacy of nonwhite perspectives has consequences that are all too real. We would do well to recall the fatal shooting of Oscar Grant on New Year’s Day by Oakland Bay Area Rapid Transit police officer Johannes Mehserle. As groups such as Human Rights Watch, the Ella Baker Center for Human Rights and the Malcolm X Grassroots Movement have extensively documented, fatal police shooting victims are disproportionately black regardless of the color of the officer. Police brutality is but one of many complex issues raised in Do the Right Thing. Community empowerment, gentrification, social mobility, economic opportunity, ethnic competition for space, state authority and racism all figure into the Bed-Stuy matrix. While scholars and activists have long debated the question of racial inequality, with few exceptions, the dominant culture appears steadfast in its blindness to the conditions that necessitate such debates. Just as Lee was frustrated that film critics focused on the loss of white-owned property and not the black man’s life, today many are disturbed by the way the media assailed President Obama for claiming that the Cambridge police “acted stupidly” in its handling of Gates’s arrest, refusing to contemplate the significance of the president’s only half-joking remark that in similar circumstances at the White House he would have been shot. Lee’s film, like most, ultimately offers more complex questions than answers, but its unflinching achievement is its consistent challenge to Americans to grapple with the dynamics of race, class, power, mobility and privilege in ways too few films have done since. Although Do the Right Thing has been frequently criticized for its black nationalist leanings, the film maintains its relevance as a racial Rorschach in which our separate-but-not-equal fears become evident, and points out the contradiction between the rhetoric and tactics of civil rights, the American Dream and the complex reality of black life. In 1989, the year Do the Right Thing was released, I was in my final year of high school in the suburban South. I did not know much about cities, but I knew something of race and its divisive, sometimes overt, but often hidden effects on communities. 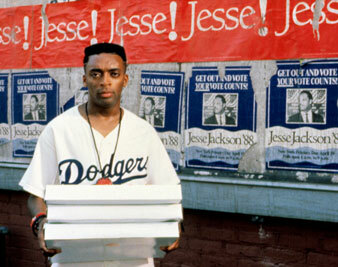 Do the Right Thing gave voice and shape to my sense of racial discomfort and anxiety. Through the visual it made the consequences of racial inequality and misunderstanding concrete. I’ve spent the last two decades devoted to academic inquiry and organizing efforts around the issue of race in America. I’ve never before traced my political, racial commitments to that film, but maybe, just maybe the seeds were planted in that theater. That black folks would understand Mookie’s actions while many whites would not is no surprise. For whites, the idea that violence might be a rational reaction to oppression makes little sense, or rather, scares us, because we know the direction in which that oppression has run for so long. Mookie in that one moment goes from being the reasonably calm, unthreatening black man, to the embodiment of white anxiety. That his action was actually a response to the murder of Radio Raheem–and that the latter was an instance of systemic and sanctioned state violence–is often ignored. For whites to roundly condemn Mookie’s actions, while remaining largely silent about the murder of Radio Raheem, suggests that at a deep and disturbing level–perhaps so deep as to be subconscious–many white folks consider a white man’s property as equal in value to a black man’s life. Interestingly, I remember when I saw the film, thinking that Mookie, by redirecting the crowd’s anger toward the pizzeria, may well have saved Sal’s life. To me, his actions were a reminder that the problem is more systemic than merely personal. Sal’s became a symbol of black disempowerment, but Sal himself, in the end, was not the principal enemy, however much his own prejudices manifested throughout the film. Do the Right Thing still relevant? Well, none of Spike’s characters likely still live on that block. “Larry Bird” hasn’t just stepped on Buggin’ Out’s new Jordans. He has taken the entire neighborhood. The same killer cops patrol the newly displaced in their now-suburban colonies in precisely the same manner, mildly harassing Harvard professor “Mookies” while killing the everyday Oscar and Sean Raheems. Today, Mookie still bends to pick up the scraps thrown to the ground by his white benefactors; but Love-Daddy can no longer tell us “the truth, Ruth” because he is syndicated by Sal’s nobles, assuring that that either a Hot 97 or a hot 50 kills Radios everywhere, in vestibules, cars or while awaiting trains. And worst of all, throughout black America radical change is simply individual, disorganized, stammering signifiers of defeat. Relevant? It is so relevant that nothing of its kind will again grace a mainstream screen. Regarding the chemistry of the cinematic and the social, the most interesting “thing” about Do the Right Thing is both how little and (perhaps) how much “things” have changed since ’89. As I have argued elsewhere, the “new black film wave” started to plateau at the end of the ’90s with about twenty or so black-focused or -directed features of varied scale and quality released yearly by the mainstream film industry. Here, nothing has really changed. Accordingly, Do the Right Thing‘s social themes–police profiling and brutality; urban, ethnic conflict; the crisis in black families and relationships–all endure, if they haven’t intensified. Conversely, the “Age of Obama” suggests some remedy to these issues. Yet the rhetorical jujitsu of “race” continues. Note some senators accusing Judge Sotomayor of “racism” during her confirmation hearings, or the “Skip Gates police affair” blowing up and sustained in the national media. Tellingly, we now need many more filmmakers with the cultural, aesthetic creativity and social focus of Spike Lee, as evinced in Do the Right Thing. Viveca GreeneViveca Greene is a visiting assistant professor of cultural studies at Hampshire College. She is currently co-editing a book on humor, irony and post-9/11 politics with Ted Gournelos. Chris TinsonChris Tinson is an educator and radio journalist living in Holyoke, Massachusetts. He is an assistant professor of African American Studies at Hampshire College.